Riding a hoverboard is lots of fun. Over the past three years, self-balancing scooters have seen their fair share of hitches. When they were first introduced, it was all merry until the batteries started short-circuiting and catching fire. With increased demand, manufacturers had devised methods of using cheaper materials including defective lithium-ion batteries to meet the price of the average consumer. 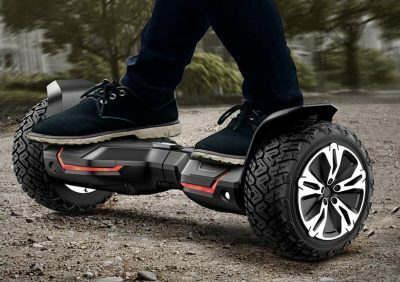 But this led to the battery problem where in July 2016, the United States Consumer Product Safety Commission had to recall over half a million hoverboards. Eventually, there had to be a standardization body, and that is where the Underwriter Laboratories UL2272 and UL2271 Safety Standards came in 2016. Today, self-balancing scooters have to pass stringent standardization and safety tests before they are released in the market. Today, we bring you top-rated hoverboards. These are models that give you an environment-friendly way to make your daily commute. You can expect long battery lives, high maximum speeds, and long distance travel on a single charge. 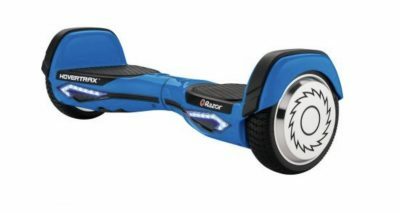 The Swagtron T380 is not a new entry in the Hoverboard market as it was introduced in 2016. Designed for newbies and seasoned users, this self-balancing scooter is a top pick as one of the safest on the market. Swagtron T380 meets and passes stringent UL2272 safety standards. It uses improved software to make it more responsive on the road. With a top speed of 8mph, this hoverboard will get you to work in less than an hour. It has a mile range of 11 miles meaning you can go even further on one charge. This self-balancing scooter is furnished with two powerful 250W motors. The motors power this hoverboard to achieve the top speeds so you can say goodbye to being stuck in traffic. With the indicator lights, other road users can see you. It is a nice feature as it keeps you safe. You should always remember to check the lights status to prevent riding blind. You can pair the Swagtron T380 with your smartphone to start listening to music right away. It has Bluetooth speakers so you can enjoy your ride with your favorite tunes playing. This self-balancing scooter comes with small wheels which are a clear indication it will suffer when used on rough paths. As such, you will want to stick to smooth tarmacked roads and avoid potholes. Verdict: The Swagtron T380 self-balancing scooter meets our expectations for the commute. You may not be able to perform stunts on it or visit the backcountry, but it is a good companion for daily use. It has a long running time of 75 minutes, so whether you are just picking groceries or you want something stylish for work, you have yourself a winner with the Swagtron T380. Don’t be limited to smooth roads and pavements when you can ride the backcountry with Swagtron T6. This self-balancing scooter favors heavy users and riders looking for exhilarating speeds. 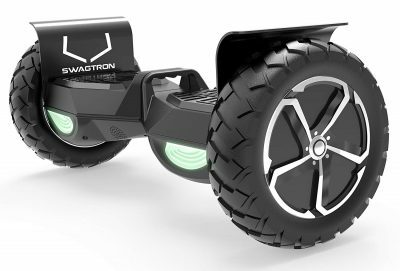 Swagtron T6 can achieve speeds of up to 12mph while carrying a rider up to 420 pounds. It showcases exceptional performance no wonder it has the premium features and a high-end price. It comes with rugged 10-inch wheels that you can use just about anywhere the ride takes you. The hoverboard can ride over inclines up to 30 degrees high and roll over bumps with pride. If you like testing your limits, you will want to ride this exact model. The tires are all tubeless and nylon-infused to ensure it can steer through the rocks and obstacles with exceptional comfort. This self-balancing scooter boasts deep treads that will also skid over mud. You will like that it exhibits durability through the use of aluminum and ABS plastic on the body. The scooter has LED lights and three riding modes. It also has Bluetooth speakers and app support to access the modes, battery life, and speeds. This is one of the heaviest self-balancing scooters. As such it is not a lot of fun to ride since it cannot perform stunts. It is also harder to control so you may take longer to feel comfortable on it. Verdict: If you live in a hilly area, you will want to consider Swagtron T6. It is one of the top scorers for the outdoors where the terrain can be hard to manage on a scooter. It provides smooth rides, and it has excellent mileage. 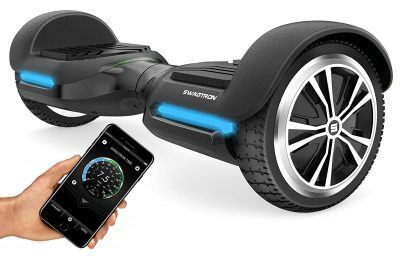 The Swagtron T580 Self-Balancing Scooter features all the top components of a best-rated hoverboard, but it is very affordable. It has Bluetooth connectivity and wide tires to tackle most terrain but not the roughest paths. This hoverboard boasts powerful performance and safety. With an efficient lithium-ion battery and dual motors, it can gain speeds of up to 7.5mph. It offers a mileage of 8 miles on a single charge which is at par with most needs of using a self-balancing scooter. This model is lightweight, but it can support up to 220 pounds. 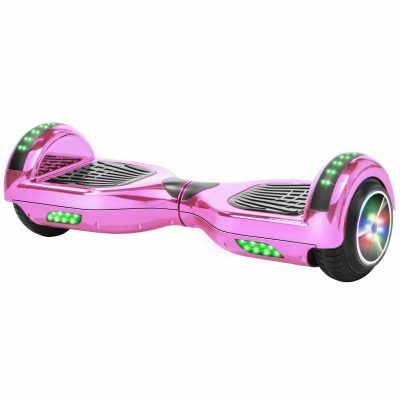 It assures that you will be comfortable and safe riding the hoverboard. It does not need any training as it uses dynamic equilibrium and responsive sensors to give you a fast, balanced ride. The 6.5-inch rubber tires are fit for the outdoors but don’t expect them to ride a beaten path smoothly. It is also splashproof such that it can ride in the rain and on puddles and it won’t risk short-circuiting. 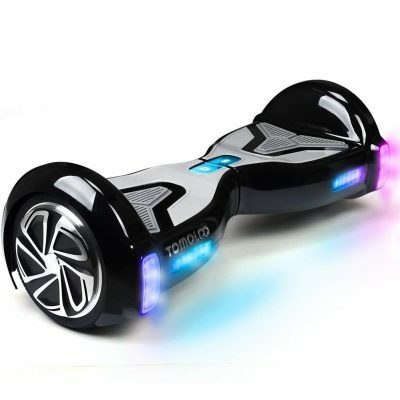 We feel that this hoverboard is suited for short distances like the park or short campus rides. This is because it is much slower than other hoverboards which affects how far it can go and the amount of fun you can have on it. Verdict: Swagtron T580 is a perfect choice for beginners and anyone looking for an affordable self-balancing scooter for short rides. It has intuitive features that make it a safe bet for most users. It can cruise the streets thanks to the LED lights plus it has responsive sensors that keep you on the scooter at all times. The Gyroor Warrior 2018 has a sturdy build to face off the elements and the roughs of the outdoors. It looks amazing and future-oriented with flashy LED lights and advanced self-balancing technology for improved control. This hoverboard provides lots of fun when riding the outdoors. First, it has a powerful 700W motor to provide a comfortable and relaxed ride on all sorts of terrain. It can make 360-degree turns and can roll over inclines and bumps. Gyroor Warrior maintains top speeds of 9.9mph on both ascending and descending courses. It will give you a ride of up to 9.5 miles on one charge. With the 8.5-inch rubber solid tires, the scooter can cruise over all sorts of obstacles to ensure you will have an awesome ride each time. The Bluetooth speakers also add into the fun as you can tune in to your playlist. This hoverboard is supplied with rubber protectors and the carry bag. You will be able to bring it to the park on your shoulders. This version of this self-balancing scooter does not have a support an app. This means you cannot change any modes on an app or see the battery level from your phone. Verdict: Gyroor Warrior is all about powerful rides. It has all-terrain wheels that can ride comfortably over different types of roads with a decent battery life and top speed. When you want to have some fun with your kids, grab one of these. Promise, you won’t tire of it! EPIKGO Sport Balance is a heavy-duty model that is a force to reckon with in the world of self-balancing scooters. From the frame to the wheels and balancing technology; you are about to experience lots of fun on this model. 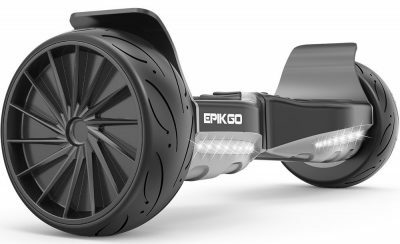 EPIKGO Sport features an aluminum alloy frame. It can withstand abuse when used in the harsh outdoors. It has 8.5-inch performance tires that feature high treads in a three-level design. The tires are designed to offer dry handling grip, more acceleration, and enhanced torque. With an 18-degree max incline angle, the hoverboard is an equal opponent against bumps and inclines. 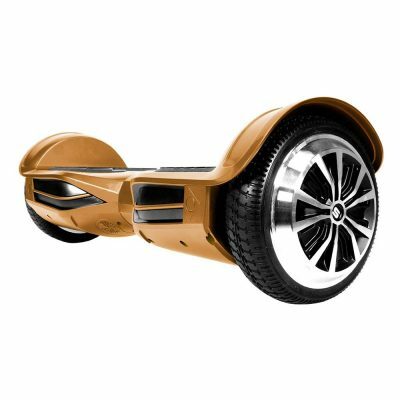 You get to enjoy speeds of up to 10mph thanks to the 400w dual motors on either side of the hoverboard. It is an epitome of comfort seeing that is much wider than other models. It has non-sleep rubber foot pads that offer you a sense of control at all times. With the front headlights and the rear blinkers, you will be at par with other road users as you can be seen and be able to indicate direction safely. Not forgetting, it meets industry standard safety tests by UL2271 on its 36V lithium-ion-battery. The battery takes only takes 2 hours to charge and so you can be back on the road as soon as possible. This hoverboard has an upscale price, yet it does not have some extra features like a companion app and Bluetooth speakers. It will also struggle over high inclines, and it loses its mile range when ascending a hill. Verdict: If you yearn the feeling of floating on air, EPIKGO does not disappoint. It has incredible top speeds that will make your cruise more fun. It explores safety features that make it easy to control the scooter. But it is not a good pick for beginners. This brightly colored hoverboard has both adults and kids in mind. It can support riders from 44-220 pounds. Kids love it more because of the themed colors that make it stand out in streets. GOTRAX Hoverfly Eco has a top speed of 7.4mph. It is comfortable for most young riders as it feels safe and easy to control. It has a UL2272 certification for the electrical and battery system. This self-balancing scooter is ideal for smooth pavements and roads. It has average treads which indicate it will not perform well when subjected to the rough. This hoverboard claims to have a 12-mile range on one charge. While this may be true for kids, the scooter does not live up to this claim for adults. It makes a range of 8 miles with adult weight. But we do like that it has a battery indicator and that it will show you when it’s time to recharge so you can bring it home in time instead of having to carry it. GOTRAX Hoverfly Eco has a training mode that makes it effortless to ride for beginners. It has a 0-degree turning radius that makes it easy to turn on sharp and narrow corners. This feature means you will not lose your grip when you have to navigate a dangerous path. This hoverboard is more attractive to kids meaning adults will not have as much fun riding it. It indicates it has a large weight capacity but mile range and battery life suffer when used by heavy riders. The scooter cannot manage rugged terrain too. Verdict: Although it has a lower top speed than other self-balancing scooters, the GOTRAX Hoverfly Eco is still an incredible cheap model for adults and kids. It will be fun for kids while it will provide a good commute choice. 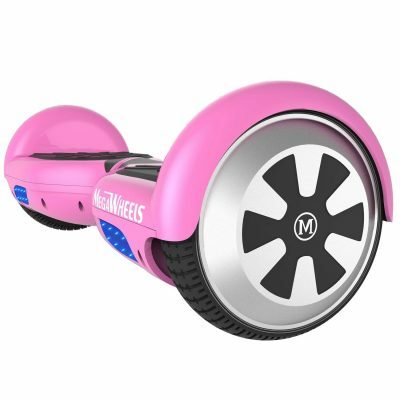 MOZZIE Hoverboard comes in an ergonomic design with a broad and non-skid surface. It will get you enjoying your ride in the first couple of minutes so be ready to have an awesome time. It is easy to bring to the park and carry up a flight of stairs thanks to the built-in handles. This is a high-performance self-balancing scooter. It provides natural balance using TruRide software that is constantly updated to suit a specific rider. You will find that even if you are not that experienced, it will not be that much of a hassle to ride. The scooter comes with a companion app where you can access the settings and tune them to your ideal ride. It comes with front and rear LED lights that can be tailored to blink according to your steering or according to the music you are playing using the Bluetooth Speakers. The mile range of this scooter depends on the riding factors like your weight, wind, and the road, but it has been lab tested to achieve a speed of 10.4mph. This feature allows it to be used in lots of ways from commuting to riding in the park and around the neighborhood or even riding across campus. This hoverboard is heavy, but it does not have a large weight capacity. It limits heavy users from riding on it. Verdict: The MOZZIE self-balancing scooter has some unique features to offer the every-day user. You get a model that is well-made and easy to ride from the very start. The scooter uses TruRide stability technology to ensure that everyone will have a remarkable time. From the colors to max speed and the construction of the XtremepowerUS, you can tell that this scooter is designed with ladies in mind. This self-balancing scooter comes in bright colors that girls will love. It is all fun with the LED lights that bring out the beautiful side of this scooter. The lights also make it visible day and night thus giving you a safe ride. XtremepowerUS can make 360-degree turns and can incline up to 5 degrees. For those of us who like playing it safe, you can stick to the flat and smooth pavements, but don’t be afraid to kick it up a notch over small bumps. It is a true test of speed since it can reach a maximum speed of 8mph. You can enjoy being in the outdoors and feel the wind against your face as you cruise at incredible speeds. The UL certified 36V lithium-ion battery gives you up to 12 miles range on one charge. All along, you will be singing to your favorite tunes on the Bluetooth speakers. The battery life of this scooter does not meet the specifications stated. You may see a decreased use especially with riders weighing close to the max weight capacity of 200 pounds. Verdict: XtremepowerUS showcases reliability in different ways. It is UL-certified, and it has an excellent top speed and range. For a self-balancing scooter that is so affordable, it has included all the features we expect in a top-performing hoverboard. The Segway miniPRO scooter is an innovative model that brings you convenience and versatility. It has a durable frame, pneumatic wheels and can be controlled via Bluetooth. This scooter is designed with a knee control bar that helps you learn to ride the scooter in minutes. Just stand on the foot pads, and the precision sensors will keep your body balanced along with the knee-bar. The knee bar is height-adjustable allowing it to be set at the exact position of your knees. The scooter is Bluetooth enabled for mobile controls. This means you can set the speed and lights that you want and have a ride customized to you. The hoverboard has a construction from aircraft-grade magnesium alloy meaning it will be durable for years. It reaches a top speed of 10 mph, and it can give you up to 14 miles on a single charge. With the automatic head and tail lights, this scooter will provide a safe ride even after dark. We like that it has an anti-theft feature on the control app so no one will get away with your scooter when its parked outside a grocery store. With all the control features that this scooter brings, it is still a little bit tricky to make turns This indicates it will be good if you taught yourself to ride in a comfortable environment than hitting the streets right away. Verdict: If you are looking for a personal scooter for the commute, you might have just found your match. This scooter can get to high top speeds and go even further than other self-balancing scooters. Once you have mastered your skill, it will be lots of fun and a conversation starter all thanks to its unique design. TOMOLOO Hoverboard comes at a midrange price, but this does not mean its performance suffers. This self-balancing scooter has some features only other models can dream of. First, this hoverboard has RGB lighting that you can choose on the app. It looks great on the streets making sure you catch the attention of motorists for a safe ride. It will perform with excellence as a commute self-balancing scooter thanks to its 10mph top speed and a range 12 miles. 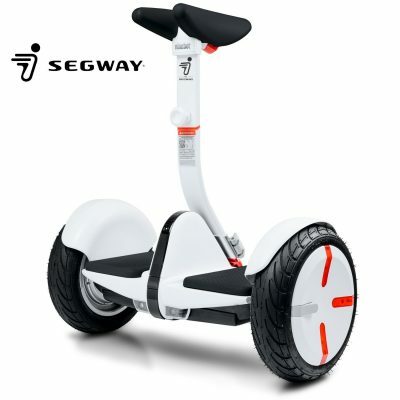 The scooter rides smoothly and silently even with the 300W dual motors. This feature helps to keep your ears alert such that it will not distract you when riding alongside traffic. You will appreciate that it has an explosion-proof battery. This means it will not overheat whether its charging or you are riding it. In fact, it has a fire-retardant shell that will not catch fire even from other sources. TOMOLOO boasts that you can learn to ride in as little as three minutes using its self-balancing technology. For guys who have been riding scooters its easy peasy but for first-time users, you may still need a couple more minutes to feel like a pro. We feel that the quality of the charger could be better or have a long warranty period. Many users complain about a failed charger, and even though the company has great customer service, and always sends a new one, it would have been of good quality to start with. Verdict: TOMOLOO has done an outstanding job on this self-balancing scooter to be able to offer it at a midrange price. It is a competitive model that sits right in at the industry standard. From the top speed to the mile range and design, you can tell it will perform well. It even has more customization thanks to the RGB lighting. 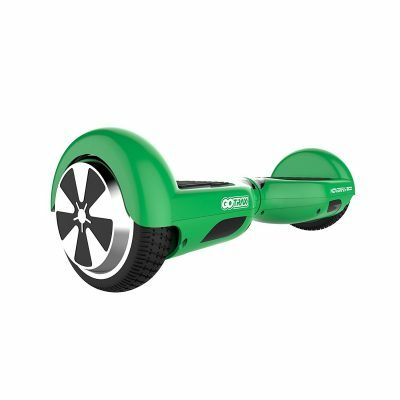 With dual 500W motors, the Megawheels self-balancing scooter provides loads of fun for the energetic teenager. It can perform stunts as it is not bulky and it is effortless to keep in control. This hoverboard provides exceptional control for beginners who have never ridden a scooter before. The fact that it uses advanced self-balancing technology means it will just be a matter of minutes before you feel in total control. We can even see you performing stunts on this scooter before a week of riding is done. The anti-skid foot pads provide fatigue-free rides. This way, you can keep using the scooter for as long as you have some running time on the UL-certified Lithium-Ion battery. It works with inclines giving you decent speed when going uphill. To ensure that you are always in the safe zone, this scooter employs an alarm for high speeds. It ensures you are always aware of your cruising speed so that you can be extra careful when riding in a busy street. The introduction manual is not clear, so when you need to troubleshoot problems, it will be difficult to follow what the manual is telling you to do. Unless you call customer support or find a YouTube video addressing your particular problem, you might be stuck with a device that does not work as desired. Verdict: Megawheels has given thought to the construction and designing of this scooter. It serves well for most of its features to give you a cool experience. It has rugged wheels that will adapt to many types of terrain, so you are not stuck to the pavements. With its many safety aspects, you don’t have to worry about being thrown off the scooter. Razor is not new to the world of wheeled toys. The Razor Hovertrax 2.0 is a little bit different from other self-balancing scooters. Although it’s advertised as best for beginners, most users associate the learning curve as similar to that of learning to use a bike. This self-balancing scooter starts to level itself as soon as it is on. Instead of waiting for you to place your feet on the pads for it to start balancing, it will twitch back and forth making it unsettling for a beginner. This feature, however, is what makes it good with an experienced user since it is more agile and maneuverable. Razor Hovertrax 2.0 is good with small inclines but not steep hills. It will ride smoothly on most roads except for gravel and dirt roads. It has an average top speed of 6mph which again is not the best in the market. We do like it though because if you are in no hurry to go anywhere, you will have an awesome time around your neighborhood. The longevity of the battery is a recurring problem among many users. It barely goes over 8 months, and if it does, it will perform for just a few minutes. StreetSaw FutureSaw Pro Edition is like a hero in the self-balancing industry. It has like every feature you ever wanted in a hoverboard. From a high top speed to the ability to support lots of weights, and having a high-gradient degree, only the high price could keep you from enjoying its specs. This scooter has a high profile standing at 8 inches high with 6.5-inch tires. It can ride over 30-degree inclines making it ideal for hilly areas. The scooter can support riders up to 300 pounds taking it up a notch higher than other hoverboards. It is a good buy for facing the elements thanks to the aluminum frame that is UV-coated. You can leave it in the sun and expect that it will not fade until after a couple of years. StreetSaw FutureSaw Pro Edition has top speeds of 12.5mph. It will give you around 5-6 hours of use on one charge or a top mile range of 12 miles. It has LED lights that will alert other road users of your presence after dark. You will love that it is lightweight coming in at around 28 pounds. The good thing is that it has a carry bag which makes it portable. Even as good as it sounds, this self-balancing scooter has a few hitches. You cannot ride this hoverboard on the beach or around water. It is not waterproof. If you ride in heavy rain or are caught in a storm, it might not function as intended. It is also not easy to replace the battery in case of any damage. Verdict: StreetSaw FutureSaw Pro Edition is an advanced model that presents distinct features. It expresses high-performance and safety features. The hoverboard is made for the streets thanks to the rugged construction and ability to climb high inclines. If you are looking for an environment-friendly means of commute or you just want to have some exhilarating fun on a two-wheeler, these are some of the Best Self-Balancing Scooters. These hoverboards showcase top-performance in their designs, speeds, and safety. Be sure to enjoy your ride with these Self-Balancing Scooters.